Through our Eyes features Aboriginal Elders and knowledge-holders from the Ngemba, Kamilaroi and Euahlayi language groups describing the land management practices and social, spiritual and cultural knowledge that enabled their people to care for the country for tens of thousands of years. Aboriginal people walked very lightly across the country and the way they used natural resources, such as water, plants and animals, on a daily basis ensured the long-term sustainability of the environment. Aboriginal people have a deep connection to the land. Their language group is a major cornerstone of their identity. They belong to the land and believe that everything comes from the land and goes back to the land. When European people moved into north-west NSW from the 1860s they not only disregarded but disrupted the practices of Aboriginal people. They restricted their access and government policy later forcibly moved Aboriginal people from their traditional lands, which severely affected their ability to practice their culture. 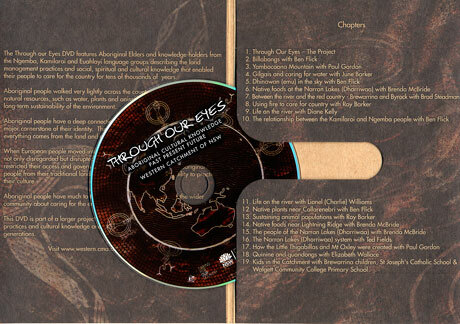 Through our Eyes documents Aboriginal land management practices and cultural knowledge in 19 short documentaries including creation stories of sites, uses of native plants, principles for ensuring healthy water sources and animal populations, using constellations to find food and recollections of the river from the past to the current day. Through our Eyes is a beautifully made, free DVD. For a free copy contact the CMA on 1800 032 101 or on www.western.cma.nsw.gov.au.